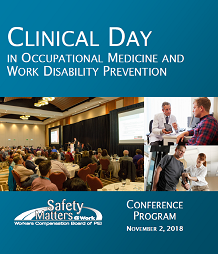 The 2018 Clinical Day in Occupational Medicine and Work Disability Prevention features workshops on a wide range of health topics, as well as a comprehensive trade show of products and services from the region's health community. To view the brochure for the conference online, click here. Long-term work disability and worklessness contributes to 2-3 times increased risk of poor general health, 2-3 times increased risk of mental health problems, and 20% excess mortality. Clinicians will be challenged to reconsider writing sick leave notes of extended duration and inadvertently enabling worklessness. Chronic pain disorders, often after minor non-catastrophic injuries, can become major barriers to successful return to work planning. Dr. Jam is an experienced physiotherapist who teaches extensively and has written on chronic pain management and prevention strategies. Throughout the day, delegates may choose 2 workshops to create their own customized learning experience. This year's conference workshops are listed below. Delegates will also enjoy an evening panel, entitled "Matter over Mind: Overcoming the Pain Barrier in Return to Work". For more information about this year's conference, please contact the Workers Compensation Board at 902-368-5680.